To create the Savile Row look I have developed three shapes of suit that reflect current trends in tailoring, known as blocks. The basic building block from which both made to measure and bespoke tailoring begin, each has its own distinctive appearance. This is quite a relaxed coat shape, easy to wear and ideally suited to a man with a fuller figure. The shoulder line is gently sloped which gives a certain informality to the wearer. The bicep on the sleeve is easy, falling into a relaxed cuff, the waistline also being easy and relaxed. The trouser for this block are high rise at the back and dipping slightly into the front. The trouser is easy over the thigh. The hem width can be tailored to the individual taste. This block has all the nuances of a British Savile Row tailored look. The shoulders are squarer and slightly narrower, the waist point is slightly high and tight to give a tall elegant appearance. The back is shaped into the side body creating a waisted effect. 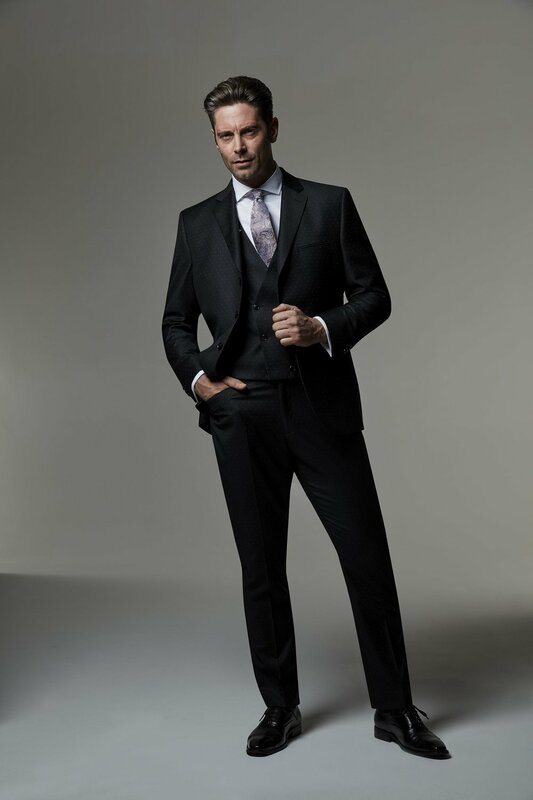 The trouser is sleek and elegant with a medium to high rise at the back dipping slightly to the front. The trouser is fitted over the thigh. The hem width can be tailored to the individual taste. This block is very contemporary and truly reflects the trend for the minimum of shoulder padding. A tight fitting block with an easy relaxed shoulder and narrow sleeve, the waistline is fractionally above the natural waistline with a lot of shaping to the centre back and side body. The trouser is the slimmest of all the blocks with a narrow leg tapering to the hem. The rise is low both to the back and front. These are all fundamental starting points where the tailoring process begins. Widths of lapel, pocket shapes, width of sleeve and finished length all can be varied to suit each client in both made to measure and bespoke. 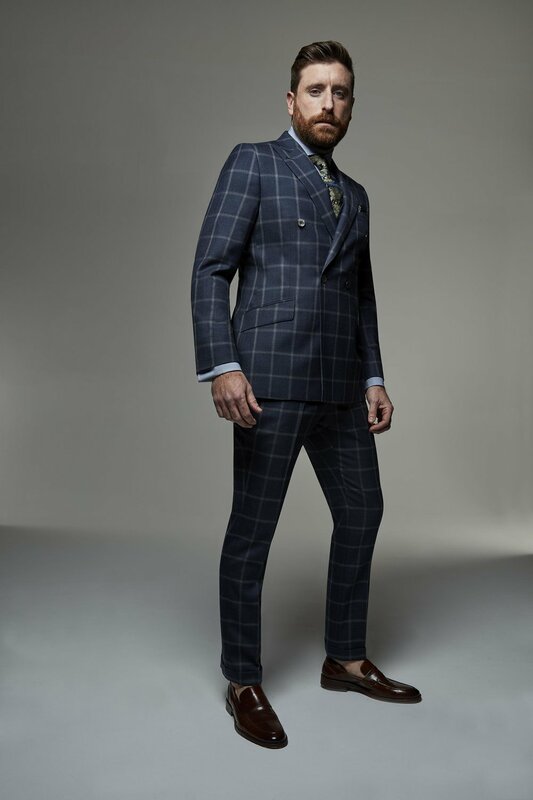 With bespoke tailoring many variations can be made to create the individual pattern exclusively for each client. With literally thousands of fabrics to choose from Jeff gives you the information you need to make an informed decision about which to go for. 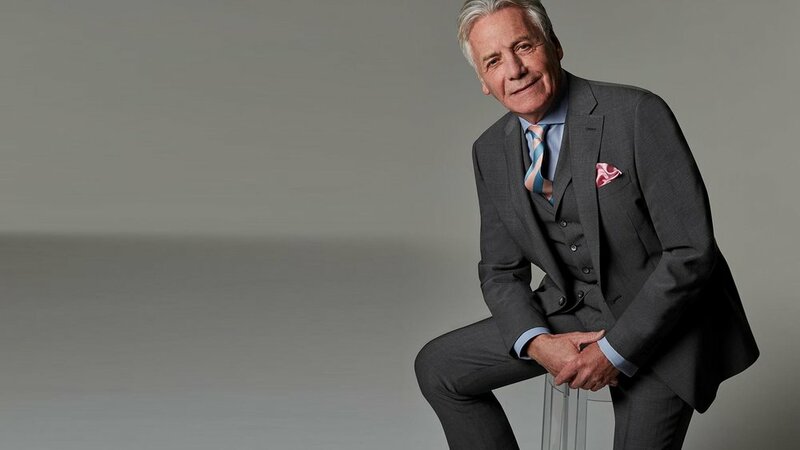 Jeff has chosen a selection of his most loved fabrics for you to have a suit made from. Take a look at how he's made his choice here.